There are several things to glean from this image. It is winter time or late fall given the lack of leaves in the tree, the buttressing of the tent with planks for heat retention and a wind break, and a chimney visible at the left of the tree trunk. They are also in a permanent fortification given the planking that makes the high wall that their tent rests against. They are wearing decommissioned federal army clothing, most clearly visible in the state of the trouser leg on the right. Army quartermasters had to account for everything, even articles of clothing that were changed out when an enlisted man’s clothing allowance allowed for replacement. Both men are wearing military issue foot ware, cavalry boots of rough out leather. The military vest, the shell jacket of the man on the right (short coat that comes to the waist with up to 8 buttons on the front without piping or epaulettes) and the sack coat and hat hanging on the tree to the left further indicate that these men have been fully furnished from military stores. The wall tent is another curiosity as it is crammed with a table and other cookware. Wall tents were supplied to officers as their quarters. Enlisted men at this time would still be living in Sibley tents or would have at this time of year constructed a winter hut made of logs and covered in canvass. From their attire they are both being paid by the army as cooks or teamsters, my guess being cooks. The refuse in front of the tent also seems to signify what role they played in the camp as cooks. The other thing to note is that in this time frame, the thought of a candid shot is unknown. One does not whip out a camera and just shoot. The table inside the tent was probably outside for normal use but stashed away. The cans on the ground splayed out by the photographer (these men, though not inducted into the military would still have had to follow decorum), the ladle given to the man on the left to hold, and the man on the right with his forage cap on the ground by his feet told to sit in a relaxed manner, the cigar being an interesting addition if posed. As long as the army was stationary, these men had a home and or an income if they were hired to perform specific duties. Once an army or unit moved on, these men would have been homeless unless they could hire themselves to another unit. 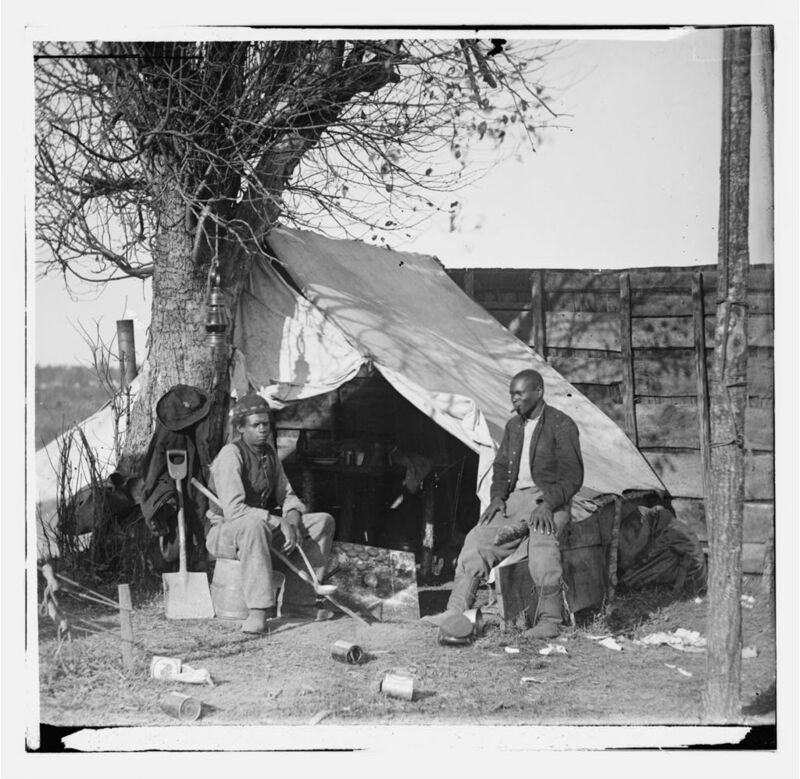 The campaign season was one of hardship for the many former slaves who managed to escape or were liberated by Union forces as the army promised no protection for families and those who could not perform some needed duty. When on the march, they would follow and camp nearby, but unless they were being utilized in some form or fashion they were on their own. Have fun noting other things from this image, it is remarkably clear and focused. Hey! I know this can be kind of off topic then again I’d figured I’d ask. Are you planning on exchanging backlinks or probably guest posting a blog post? My current blog talks about a lot of the same themes as yours and I think we might actually benefit from each other. However, if you’re interested you can easily send me the e-mail. I look forward to hearing from you! Appreciating the dedication you put into your site and in depth info you present.